Hemp isn’t just a New Age fad. Science has shown that this relatively unknown member of the cannabis family has some serious health benefits, which I’m going to tell you about. I know what you’re likely thinking of, so let’s clear it up right away: this substance doesn’t get you high. Sorry, if you want to celebrate 4/20 you need something with THC, which hemp doesn’t have and we’re not here to discuss. I have been using hemp for a few months. I’m here to tell you just how much good it’s done me, and hopefully, you get the chance to experience the benefits of hemp for yourself. Hemp also has all 20 amino acids that your body needs to function, including the ones you can’t synthesize. Hemp contains several omega-3 fatty acids and aliphatic alcohol, which has been shown to reduce cholesterol and keep those arteries in good working order (3). Sterols, another heart-healthy compound, are also present in hemp. The linolenic acids can make you less likely to get coronary heart disease: up to 20 percent less likely, in fact (4). Another compound in hemp, called tocopherol, can help prevent atherosclerosis. This isn’t the same thing as cholesterol. Cholesterol refers to fatty deposits that inhibit blood flow, while atherosclerosis is a hardening of the arteries that prevents them from expanding to carry blood. This is one of the leading causes of high blood pressure and death. As I’ve said, hemp has a lot of omega-3 and omega-6 fatty acids. These acids do a lot for your brain and body, including keeping your hormones in balance. GLA, or gamma-linolenic acid, promotes a healthy balance of estrogen, progesterone, and other female hormones (5). Hormonal imbalances create some negative health conditions like fatigue, UTIs, osteoporosis, skin problems, and decreased libido. Hemp is good at helping to regulate progesterone levels. Progesterone is a hormone from which many others derive, like cortisol (6). If your hormones are out of balance, consuming hemp can help rebalance them. In the form of oil, that is. The omega-3 and omega -6 fatty acids in hemp oil promote antioxidizing and anti-inflammatory effects, making it less likely that you suffer acne or dermatitis after about ten weeks of consistent use. (7) It also tweaks the fat composition of your outermost skin layers, making them look and feel more toned and elastic. This has an anti-aging effect on most people. Hemp can also help you with varicose veins. The reason is that the omega fatty acids absorb into the skin and act as a blood thinner. Thinner blood allows the valves to close, so blood doesn’t pool in the veins and make them swell. Hemp oil contains a strong concentration of vitamin E. (8) Per 100 grams; you get 10 mg of vitamin E with only two tablespoons, you get to have your full daily allowance of this critical nutrient. Vitamin E. It acts as an antioxidant, which helps protect your body’s cells against free radicals that the medical community thinks contributes to the aging process. One of the most serious barriers to weight loss is eating beyond the point of satiation. Hemp seeds can contain 2.5 grams of dietary fiber per 4 tablespoon servings. (10) Dietary fiber helps to add bulk to the food you eat, making you feel fuller over a longer period than if you had not eaten enough fiber. A single serving of hemp seeds gives you about 5% of your daily intake. Fiber also keeps the digestive tract lubricated and working properly. If you have any problems with constipation, adding more fiber to your diet can help. (11) The fiber in hemp feeds your gut flora, which in turn contribute to the strength of your immune system. If you struggle with stress or anxiety, taking CBD oil can help. CBD oil has been shown to rebuild the hippocampus region of the brain, which regulates the stress response. (12) When the hippocampus doesn’t work as it should, the brain can be thrown into a constant state of anxiety, releasing hormones like adrenaline and cortisol. Also, the fatty acids aid in neural communication. The brain uses fat as a myelin sheath to protect the ends of neurons from fraying away. By consuming hemp seeds or hemp oil, you’re directly contributing to brain health. I know just how hard it is to get enough protein in your diet. Cooking meat, measuring out the right amount of nuts, counting calories; it’s some of the most time-consuming and least rewarding parts of being on a healthy diet. I first got this bottle and cracked it open to make myself a protein shake. First of all, I should tell you: this isn’t going to taste good. But then, hemp is fiber, protein, and omega-3 and omega-6 fatty acids. It pushes through the digestive system and leaves protein behind. Anyway, I received the canister in the mail and opened it, spooning some of it into a glass of water. I like to try proteins with water to see what they taste like before I try introducing them to other foods. It tasted like grass smells, so I resolved not to do that again. For my next endeavor, I made an avocado/banana smoothie, added some Nutiva Organic Hemp Protein, and barely tasted it at all. The good thing is that unlike many protein powders, Nutiva was ground to almost sand-like consistency, so I had no problem getting it to dissolve in liquid. Next, without getting into the gory details, I’ll say that every since I started using Nutiva as a daily protein shake, my system has never felt cleaner other than the time I restricted myself to drinking only water. I feel lighter, more energetic, and less bloated. This was to be expected; hemp is fiber that pushes all the excess matter out of your colon. If you suffer from constipation and don’t want to break out the laxatives, this might be a good solution. It’s expensive, and comes from Canada, but in my opinion, it’s well worth it. 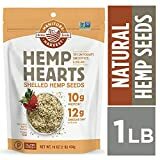 Also called Manitoba Harvest hemp hearts, these pre-shelled seeds make an excellent snack to people wanting to increase fiber and protein intake. I eat them in a similar fashion to sunflower kernels or chia seeds: straight out of the package or sprinkle them on salads, oatmeal, and other foods. A single serving has 10g of protein, which, depending on your dietary needs, can be a significant amount. For those especially conscious of their diets’ impact on the environment, you can be assured that these hemp sides are completely organic. When eating these hemp hearts, expect a slightly nutty flavor, but nothing too overpowering. It’s almost like sesame. Hemp oil drops can be used on the skin, but this particular brand is great for soothing agitated nerves. The fatty acids in hemp oil promote relaxation. One extra effect that I like about these is the sleep benefits. After about three days of taking 30 drops of oil per day, I noticed my sleep cycle starting to smooth itself out, and I managed to sleep through an entire night uninterrupted. You also don’t have to worry about any odd grassy taste: this oil is infused with peppermint to give it that nice, minty flavor. Even just the smell of mint can make you feel refreshed and ready for the day. I personally haven’t tried this product, however I heard a lot of positive feedback around me and online, about hemp oil for dog and cat. That’s the reason why I would like to share the review of one of my good friend, who’s very pleased with the use of this product for his furry family member. Yes, hemp oil is safe for dogs, as long as you follow the directions on the packaging. Hemp helps to lubricate joints. Another good thing is that it reduced his anxiety. He became his old friendly self. I can’t say the same will happen for your dog because every animal is different, but it’s worth a try. Hemp doesn’t usually contain THC, depending on where you get it from. Be careful about eating hemp products if you anticipate taking a drug test anytime soon. You won’t get high, but it may show up in your urine. If you’re using hemp oil, be careful. It isn’t a natural cooking agent and can have unpredictable reactions with other ingredients. Only use it as an oral or skin supplement. Don’t use hemp if you bruise easily or if you’re taking anticoagulants. Hemp thins the blood, so it could cause dangerous conditions if you aren’t careful. Watch your intake of omega-3 and omega-6 fatty acids. Hemp already has a lot of them, but overdoing it can lead to problems. Don’t take hemp if you also have diabetes. Omega-3s can raise your fasting blood sugar level. I hope this article has given you a little insight as to why hemp is one of the best foods you can try if you’re health- and environment-conscious. It’s important to me to try everything I can think of to boost my health with organic food and supplements. Did you enjoy this article? If so, leave me a note in the comments with feedback and thoughts. I’d love to hear how hemp has benefited your life.